Asparagus Prosciutto and Fontina Tortino is how to turn a spring breakfast or brunch into amazing! Add a glass of Prosecco for a lovely Italian-inspired experience! Do you subscribe to my weekly newsletter? If you do, you’ll see I started a new feature called “Current Cookbook Crush” because, well, I’m just a little bit cookbook obsessed. You may recall that From A Chef’s Kitchen started out as A Cookbook Obsession. I changed my blog identity because I felt A Cookbook Obsession didn’t really tell people who I was. 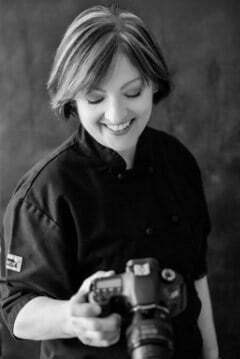 It told the world I loved cookbooks and many people thought all I did was share cookbook recipes. That wasn’t the case but I felt From A Chef’s Kitchen was all-encompassing. However, I’m still cookbook obsessed and I still love to share the ones that I think rock! 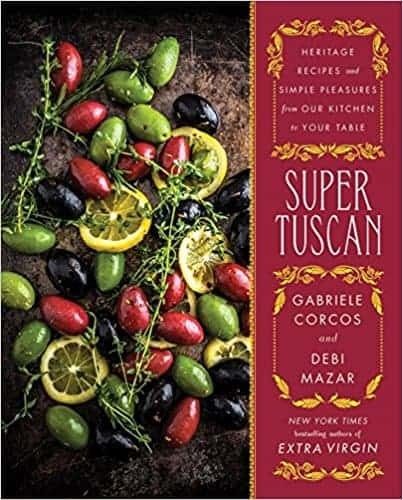 All the recipes have a simple, rustic Italian authenticity yet are sophisticated enough that you’d be proud to share them with family and friends! Do give this one a try! I don’t really care about the language. I do care that this Asparagus Prosciutto and Fontina Tortino is delicious and perfect for a spring breakfast or brunch! The asparagus. May I be frank about the asparagus? 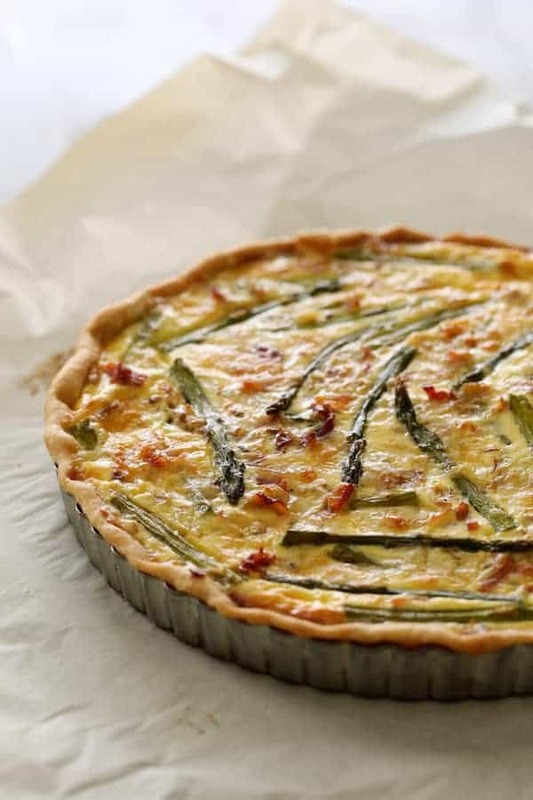 I have attempted asparagus numerous times in quiches and tarts and no matter what, they will look a little shriveled when the tart is fully baked. 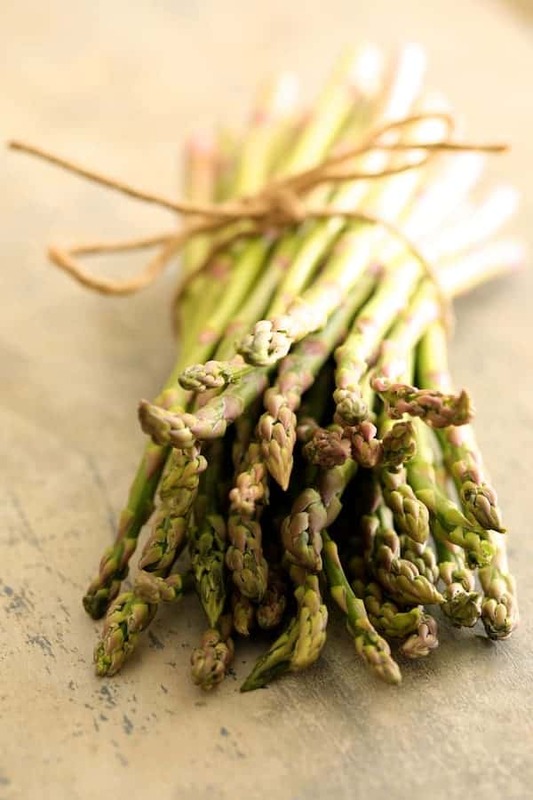 Tarts and quiches have to bake for almost 40 minutes so the asparagus won’t look like it’s freshly blanched in salted water for 30 seconds. However, it still tastes amazing! For the crust, use your favorite pie crust or use a good, refrigerated pie crust. As long as it fits in a 9 to 10-inch tart pan with removable bottom, you’re good to go! 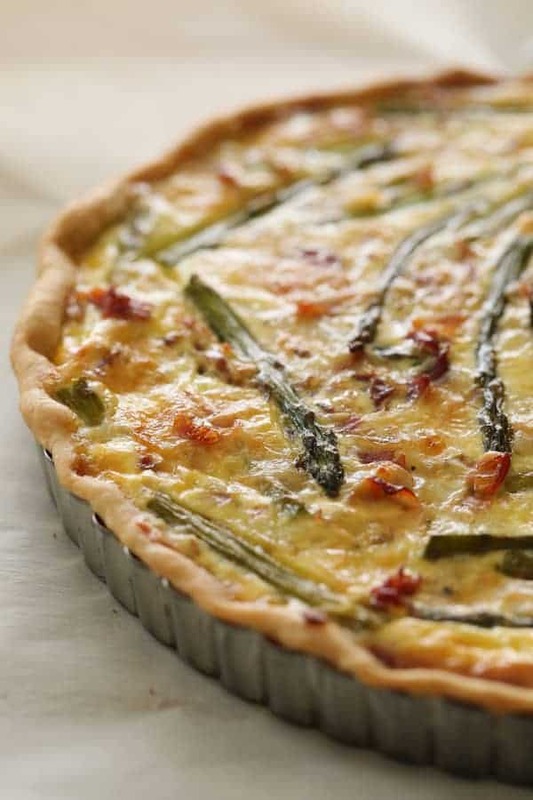 This Asparagus Prosciutto and Fontina Tortino recipe is tweaked from the one in Super Tuscan. I like to place a layer of a hard, dry cheese such as Parmesan over the crust before adding the fillings. This serves as a barrier between the crust and the wet ingredients. Fill the tart then pour on the custard. 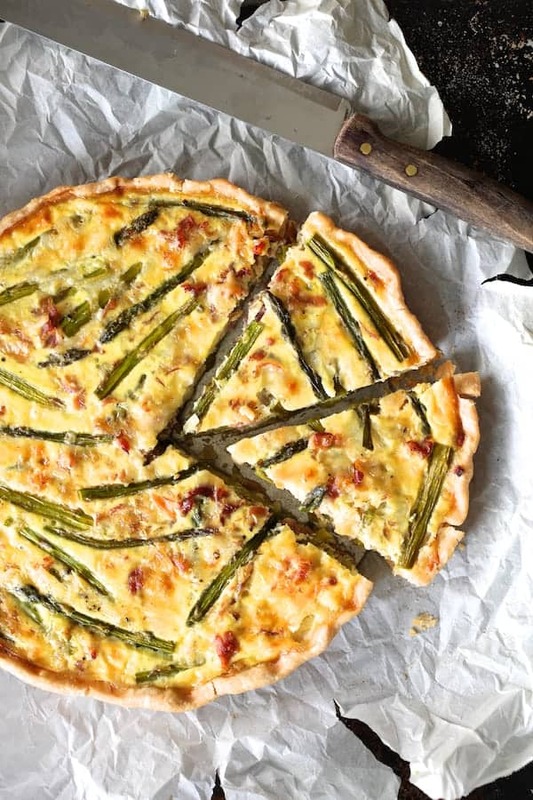 Be sure to try these other amazing asparagus tart recipes! Asparagus Prosciutto and Fontina Tortino is how to turn a spring breakfast or brunch into amazing! Add a glass of Prosecco for an amazing Italian-inspired experience! Preheat oven to 375 degrees. Spray a 9-inch tart pan that has a removable bottom with cooking spray. Place the pie crust in the prepared tart pan and fold the excess down into the pan and press it into the rim of the tart pan to form a neat crust. Place on a baking sheet. Place a piece of parchment paper over the dough and fill with pie weights. Bake for 18 to 20 minutes or until the crust is baked but not browned. Transfer to a cooling rack to cool. Meanwhile, heat a nonstick skillet over medium-high heat. Add the prosciutto and cook 3 to 5 minutes or until any fat is rendered off and the prosciutto is just lightly browned. Transfer to a plate to cool. Heat olive oil in the skillet over medium-high heat. Add the shallot, reduced heat to medium and cook 2 to 3 minutes or until beginning to soften. Add the asparagus and stir-fry 30 seconds. 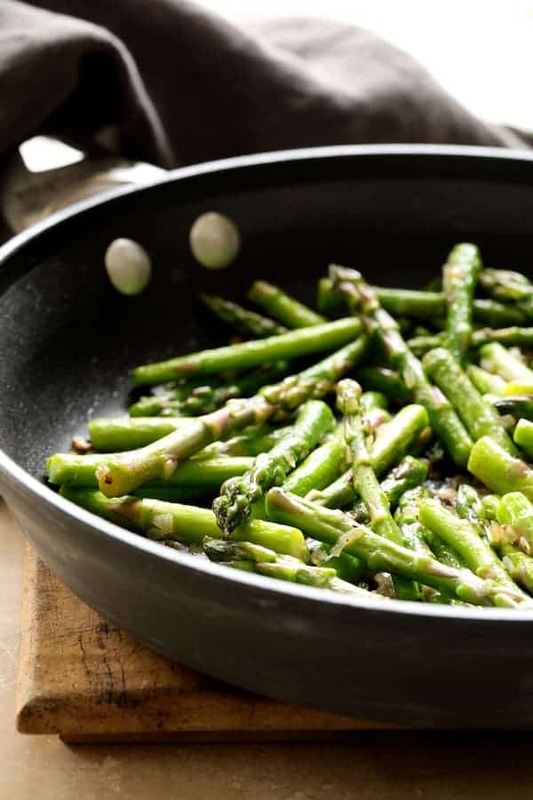 Add 1 tablespoon water and continue cooking 1 more minute or until water has evaporated and asparagus is bright green. Season with a pinch of salt and black pepper. Remove from heat and allow to cool. Sprinkle Parmesan cheese over the bottom of the baked crust. Combine prosciutto, asparagus and Fontina cheese (either in the skillet used to cook everything or in a bowl). Transfer to the prepared crust and evenly distribute everything, pressing it down into the crust so the top is level. Whisk together eggs and half-and-half (or milk). Season with a pinch of salt and black pepper. Pour custard mixture over asparagus mixture. Bake at 375 degrees for 10 minutes. Reduce heat to 350 degrees. Bake another 30 to 40 minutes or until set and top is just beginning to brown. Let cool in the pan 10 minutes. Remove the pan sides and cut into wedges. Serve hot, warm or room temperature.